Coding is, apparently, the new language we all need to learn. It's billed as essential by the likes of Bill Gates and Stephen Hawking. General Motors CEO Mary Barra calls coding a "core skill" that you need to learn if you want a high-paying job. But what if this emphasis on coding is distracting us from teaching kids about other, more important things that they'll actually need for the jobs of the future? Marina Gorbis, executive director of the Institute for the Future, sees this obsession with coding as the equivalent of putting all our eggs into one basket. "I'm not saying that coding isn't important. We need lots of people who are coders. But the programs themselves that they're learning will be obsolete in several years, so you need to have deeper computational intelligence to be successful," she tells CBC's On The Money. By that, she means the ability to identify, explain and tackle problems in the digital age. Part of the reason for this is that we don't really know what the jobs of the future are going to be. We have no crystal ball. According to a recent IFTF report, 85 per cent of the jobs that will be around in 2030 don't even exist now. So it's pretty tough to plan for a future that most of us can't even imagine. "If you think about Uber five years ago, who actually knew of a profession that was an Uber driver?" says Gorbis. Most of us didn't know what an app developer (or even an app) was a decade ago. Ten years ago, the very first iPhone was unveiled. By all accounts, there will be major changes over the next decade or two as well. 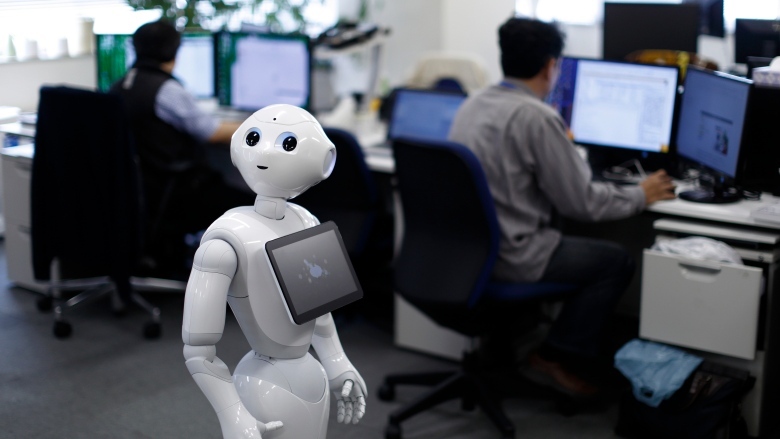 "It's really hard to predict exactly what kind of jobs will be around. But you can look around and you can see what new generations of technologies are being developed," says Gorbis. The IFTF says one thing people can stop freaking out about is the idea that robots will steal our jobs. Sure, many jobs that involve rote learning and lots of repetition are in danger. But technology will create new jobs. A big driver of that will be the so-called Internet of Things, or "invisible" tech that blends seamlessly into our surroundings. "One of the things that we do know is that these technologies will be imbedded into the fabric of our everyday lives," says Gorbis. The key, she says, is adapting to the automation and machines around us. "Some of these jobs may not disappear but the nature of what is involved in the job will be changing." Think of these machines as additional tools to enhance productivity, she says, the way a hand axe — one of the earliest human-made tools — is used to enhance human power. Or how a vacuum cleaner, lawn mower or personal computer is used to save time and do a better job. The IFTF suggests that by 2030, we may see a new era of human-machine partnerships. In this scenario, the most successful humans will be the ones who have the ability to work side-by-side with their robotic colleagues. When you combine this with the latest augmented-reality devices, the IFTF says the potential for learning on the job goes through the roof. The organization's futuristic example is of a worker named Lydia who studied auto mechanics and found steady work as an automotive technician at a large dealership shortly after graduation. With the introduction of AR in the repair shop, Lydia no longer has to take courses to upgrade her skills. Instead, when she's faced with an unfamiliar task, she slips on her safety glasses equipped with AR technology. As she starts to work, all the information she needs pops up in her field of vision, guiding her through everything. According to Gorbis, this may be the greatest gift of all from our robotic co-workers. "It opens up really remarkable new opportunities for learning in place and in context. Not just in the classroom or through textbooks."